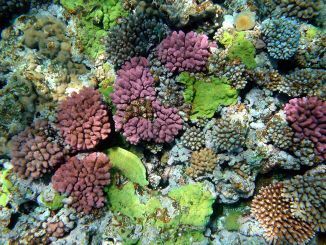 Science writer and bestselling author Steven Johnson has observed how open-Source ecosystems share much in common with coral reefs, a natural ecosystem that provides ideal conditions for a variety of marine species. I’ve mentioned before that I have a couple of close friends who teach in industrial engineering and who harbor the same intense interest in the implications of Web 2.0 as I do. At lunch a few months ago, I pointed out to them all the stuff I had stumbled across in youtube, notably an English-subtitled German docudrama about the prison life of Albert Speer based on his prison diaries and a heart-rending Irish-made documentary in Gaelic, featuring English subtitles, about the honor guard who performed at President Kennedy’s graveside service. Suddenly the thought occurred to me: An entire undergraduate, if not graduate, history curriculum could be constructed around this immense trove of documentaries, which cover virtually every significant event in human history and, in a surprising number of cases, are written from different national, cultural and intellectual perspectives. With my usual zeal, I added that these documentaries, which would take the place of conventional college lectures, could be supplemented by online reading from sundry sources. It would constitute one of the loftiest forms of exaptation to date: using material uploaded for sundry reasons, largely for entertainment, to educate a rising generation of aspiring teachers. After a little more wiki-style idea exchanging among my friends, a second realization occurred to me: Why limit it to history? An entire college curriculum arguably could be constructed around youtube documentaries and related materials and supplemented with online reading. All that’s missing are a well-oiled entrepreneur to bankroll the effort and a handful of retired, credentialed academics to vet the materials and execute the plan. Think about it: a scaled down, extremely cost-effective alternative to a conventional college education that could be offered to a handful of students and parents unwilling to pay the usual exorbitant fees for a sheepskin. Yes, I know, accreditation is an issue, but this concept doesn’t depart that radically from the Deep Springs College model, which has been around since 1917 and has educated hundreds of Americans who went on to become renowned scientists, jurists, writers and diplomats. To ensure that it passed muster among accreditation authorities and to enhance its competitive advantage vis-à-vis conventional forms of higher education, this approach could also incorporate a tutorial system similar to what is offered at Oxbridge: Students could be assigned a wide range of youtube viewings and online reading for the week, which could be supplemented by frequent meeting with their tutors to discuss the material. Why hasn’t something like this been attempted? I don’t know. Perhaps it already has. One thing of which I’m all but certain: With costs of college tuition skyrocketing, unconventional approaches such as these are inevitable. Sooner or later — I suspect considerably sooner than later — some entrepreneur will step up with a model remarkably similar to this one. That fact should drive home a critical lesson to anyone involved in education. Speaking as Extension professional, I’m still awed by the number of those in our ranks who dismiss what is occurring around us — who assume, however mistakenly, that social networking is just another skill that can be added to their educational toolkit. What they don’t grasp is that Web 2.0 has created an entirely new ecology constructed on open-source platforms. The trove of educational material on youtube is one of countless examples of how this open-source platform provides a means of multi-purposing — exaptating — material in ways that the original creators often scarcely conceive. Too many Extension educators view Web 2.0 as an add-on. What they don’t understand is that this new technology has not only reordered the educational landscape but has altered it in a fundamental way. Web 2.0 is no longer the add-on: we are. We face the same challenges as other facets of higher education: If we don’t overhaul our model to conform with the realities of this new open-source ecology, we will be supplanted. It really boils down to that hard truth. I ended 2008 with two indelible impressions that helped me gain a clearer perspective on how we, as an organization with a long, venerable history, should be passing along our institutional torch from generation to generation. The first impression stemmed from the inspiring “last lecture” of Dr. Randy Pausch, the creatively brilliant, doggedly optimistic Carnegie Mellon University professor who lost his courageous struggle with pancreatic cancer in 2008. The last lecture concept, which is used widely at many leading universities throughout the United States, was initially envisioned as a kind of dramatic device: Faculty members are invited to reflect on their lifetime insights and professional achievements as if they were delivering the last lecture of their lives. In Pausch’s case, the presentation turned out to be not only a literal last lecture but also one of the most memorable valedictory addresses in history. Recorded and posted on Carnegie-Mellon’s youtube site, the lecture soon went viral, transforming Pausch in the last months of his life into a media celebrity, a national spokesperson for pancreatic cancer and, ultimately, a best-selling author. I’ve watched the youtube lecture and read the book several times. Many of Pausch’s insights will stay with me for the rest of my life. That was my first deep impression. The second one originated from a series of conversations with a handful of friends and coworkers about the ethereal nature of institutional knowledge. Ethereal, defined as “extremely delicate and refined,” is an especially useful adjective within this context, because institutional knowledge, despite the valuable role it serves in organizations, is precisely that — extremely delicate and refined — and fleeting. Institutional knowledge is the agglomeration of facts, concepts and experiences that have been generated and refined over years, decades, even centuries, in some cases, within an organization. Despite the long periods of time required to grow and refine this knowledge, much of it cannot be fully articulated — which is perhaps one reason why it is so ethereal. Of course, other types of knowledge are also indispensable to organizational success, such as how an organization employs its formal knowledge base — the hard, empirical type of knowledge generated by research and recorded in books and other media. But the value of institutional knowledge should never be discounted. A close friend of mine who works as an industrial engineering professor at my university has observed that both kinds of knowledge, formal and institutional knowledge, propelled men to the moon and back in the late 60’s and 70’s. Likewise, a combination of the two was critical to the success of the Apollo 13 mission in 1970. Drawing on both knowledge bases, an eclectic array of rocket scientists, flight specialists and engineers collaborated effectively to fling three men in a badly injured spacecraft around the dark side of the moon and, ultimately, back to safety on earth. As I said, though, institutional knowledge is fleeting: Any NASA engineer will readily attest that the body of institutional knowledge that propelled men to the moon and that safeguarded the Apollo 13 astronauts has been lost through a host of factors, including reduced funding, downsizing and retirement. While most, if not all, of the formal knowledge associated with the Apollo moon mission could be retrieved from troves of archival materials, much of the institutional knowledge has been irretrievably lost. And without this institutional knowledge, some of the formal knowledge isn’t much good. A retired Extension colleague of mine rightfully has pointed out that Cooperative Extension is undergoing a similar kind institutional knowledge loss in the midst of funding reductions and steady retirements. Even in cases in which funding is available to replace retired Extension faculty members, the successors often turn out to be young tenure-track professionals who struggle to balance Extension work against a heavy load of teaching and research responsibilities. Consequently, many of these young Extension professionals, despite a genuine affinity for Extension work, fail to develop the same levels of refined institutional knowledge that characterized earlier generations of Extension professionals. This brings me back to my first impression: Randy Pausch and the last lecture concept. To be sure, reversing the loss of institutional knowledge within Cooperative Extension is not something that can be readily addressed. But the last lecture concept is a start. Ponder this sobering fact: We are allowing hundreds, if not thousands, of Extension educators who collectively represent hundreds of years of institutional knowledge to leave each year without sharing their insights with the rising generations of young educators who are taking their places. Last lectures are no panacea, but they are a start. They should become a revered tradition within the Extension mission as well as an integral part of a comprehensive strategy to preserve our invaluable, but nonetheless ethereal, institutional knowledge base.